An interview with Stage Director, Cathy Dunn-Protopapas, and Set and Scenic Designer, Miguel Lopez-Lemus, about their magical concept for the show. Cathy and Miguel, I understand the two of you developed a concept for Amahl that is different from what is normally done. Can you describe it for me? Cathy: Miguel and I met originally, and viewed the video from the original NBC Christmas eve 1951 production. At the time, the medium of television was new, and the production did not feature much movement. The original was also set in the Renaissance, and was based on the paintings of the Adoration of the Magi and the Adoration of the Shepherds. In those paintings, all the characters wore extremely Italianesque clothing. After some discussion, we decided that we did not want to set it in the Renaissance, but wanted to bring the story to life by setting it a time period our audience would likely envision. We discussed setting it in the original time period, but then thought of the 1950s and 60s heyday of Technicolor, and the Cecil B. Demille biblical film epics. What we came to was the concept of performing the show through the lens of the 1950s—basically, how someone in the 1950s would have envisioned the time of Christ's birth. Miguel: We then asked ourselves the most important questions: What makes this show different and exciting, and how can we achieve that? The story is simple, so how can we make it unique and keep the attention of children and adults new to the genre, and make it a magical experience? Cathy: Magic turned out to be a key word. The three kings are referred to as the “Three Magi”. Magi is actually a derivative of a Persian word that was translated through Greek to what we know today. In Persia, Magi were a caste of priests who were thought to have magical powers. As a result, we discussed the “magic” of the kings, and how we can make them larger than life. The shepherds do a lot of “thanking” of the kings during the opera, and this “magic” is what will put them in awe, beyond their august presence. How did you and Miguel create a unique way to bring the magical element to the show that patrons can really enjoy? Cathy: To create the magic we needed a fantastical element that transcends the production. Miguel: The concept was to offer paper mache sculptures of oversize heads on the kings and camels to represent their “magical nature”. Sculptures like these are popular in festivals in Spain and Germany. To create them, I used a type of the paper mache called cartoneria. It’s a Mexican style of working with paper mache—which, of course, is a French process. The sculpture is created using simple material like paper bags bound together with wheat paste and water. Every show needs that one central takeaway that should have personal meaning to each patron. 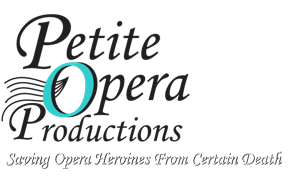 As part of its mission, I know that Petite Opera avoids presenting to patrons, but instead tries to include them in the story and action. How do you draw the audience into this production, and make the story personal for them? Miguel: Amahl and the Night Visitors is a simple story, really. It’s a question of faith, Christianity, and spirituality. Cathy: We definitely wanted to get that across. When Miguel and I began discussing the show, he challenged me to distill the meaning of it into one word or phrase. I was hard-pressed to come up with one word, but the phrase that describes it was obvious: the transformative power of giving. It’s true on every level. At some point in the show, everyone gives something—whether material or part of themselves—and this giving helps define them as people. In this, the characters are like every audience member. Miguel, during Petite Opera’s Hansel and Gretel show last fall, your Ilsenstein Forest became a character of its own in the show. Does the backdrop and set for Amahl play a distinct role in this production as well? Miguel: I asked myself that question. Then I asked, “What defines Christmas?” At first, I wanted something simple, like a crèche. And while, structurally, we developed many concepts; we were limited by the venue itself. As a result, the set is a city backdrop—adobe style—with huge courtyard patios inside. We needed these to provide ample space for movement. The challenge was how to keep it open enough and use minimal space while communicating the abject poverty in which Amahl and his mother live. Poverty dictates minimalism by its very nature. So the minimalism itself represents what the two of them may become if not for the transformative power of giving—a lifeless, empty shell. Cathy, what about costumes for the production? You said you were looking through a lens of the 1950s. Does that mean the costumes will be circa 1950? Cathy: Ultimately, that’s not where we ended up. When we first started talking about costumes, we discussed that Hollywood has a distinct way of looking at things by period, so we discussed the Hollywood of the late 1950’s early 1960’s, and how that body of people would have viewed the original time of Christ. We envisioned all of the performers wearing similar style tunics and bottoms. That depicts that all of us, our souls, if you will, are the same underneath. Each of us is unique beyond the soul, and so the outer trappings of the costumes reflect our individuality. Cathy Dunn-Protopapas enjoys a diverse career as a stage director and singer. She has directed for such companies as Intimate Opera, Richland Light Opera, Opera in the Ozarks, Bel Cantanti Opera and Petite Opera, where she directed the 2010 production of Hansel and Gretel. She has appeared in over 100 Lyric Opera of Chicago productions as a member of the full-time opera chorus, and is an alumnus of a Lyric Opera artist training program, which has since become the Ryan Center. Miguel Lopez-Lemus is the ultimate “Renaissance man”—an active painter, sculptor, master of poetry and prose, photography, drama and directing. Amahl represents his second production with Petite as scenic and set designer. Born in Mexico City, he has directed over 70 productions ranging from classical to experimental. He and Cathy Dunn-Protopapas have known each other over 20 years and collaborated together on over 10 productions. Petite Opera’s Amahl and the Night Visitors opens at Mary Wilson House Beyer Auditorium in Park Ridge on December 2, 2011 and runs through December 11, 2011. For ticket information, call 847.553.4442 or purchase online via the Purchase Tickets button above.